It is important to have in depth understanding of the physical and chemical process clay goes through during drying and kiln firing. Having this understanding will help in avoiding clay and firing defects with your project and can help troubleshoot many of the problems you experience with your pieces such as cracking, breaking, exploding and glaze defects. 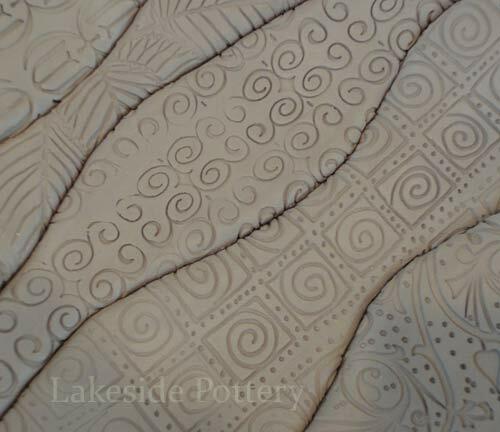 Clay shrinks both in drying and in firing. 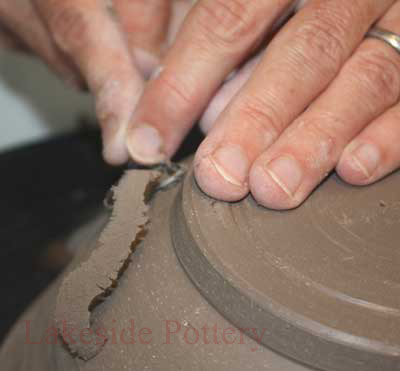 Different clay bodies shrink at different rates which can be as little as 4%, or as much as 15% for some clay bodies. Even one percentage point can make a difference in the final product depending on your need for precision. Your design, therefore, needs to account for the shrinking for the temperature to which you fire. 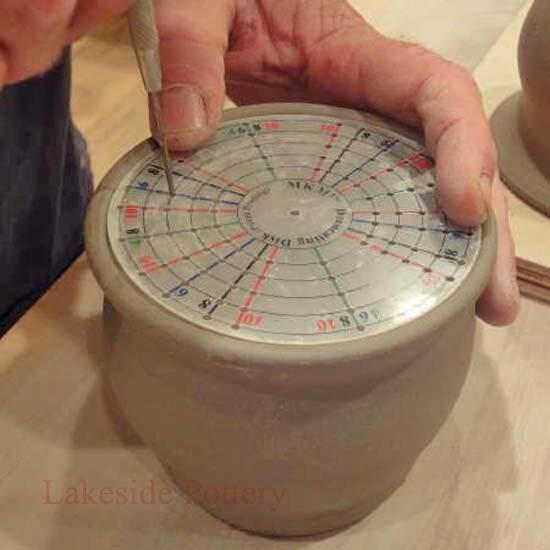 For example of the clays we use at Lakeside Pottery is Standard's Baldwin 192 and it is specified to shrink 11% for cone 6 firing temperature. 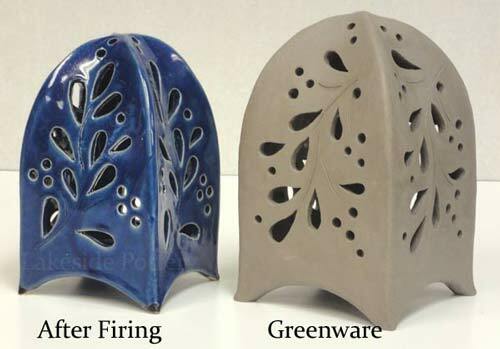 Our testing showed that about 5% shrink during the drying process, 1/2% during bisque firing (cone 06) and 5.5% during glaze firing (cone 6). The total of 11% is shown in the lantern picture below (before and after). We also found through out after years of firing that even with the same clay body, shrinkage can vary 1-2% from batch to batch. Where accuracy is important, we run a batch test before proceeding with a project or tell our commission customers to expect +/- 3% variance. 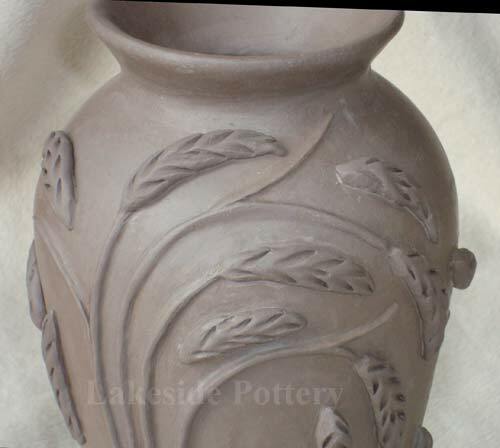 Average clay contains about 20% water and 9% organic matter, thus, finished pots (bisque or glazed) weigh almost 30% less than the initial clay weight. 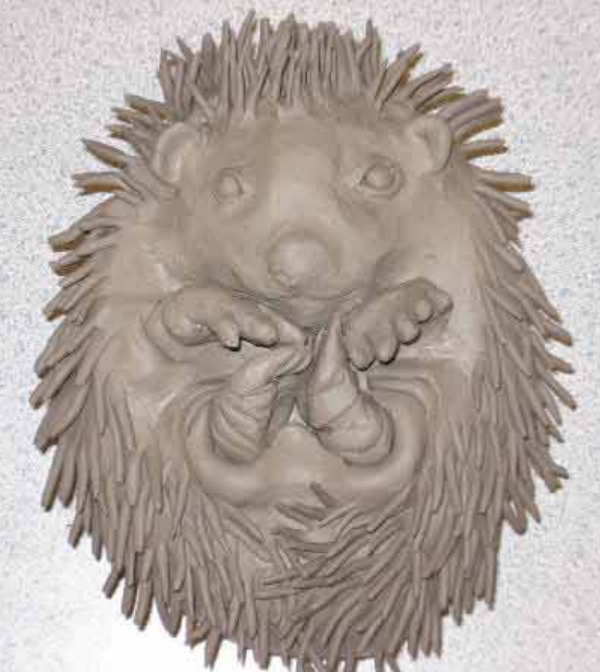 Why is it important to let clay work dry slow? Be aware that the larger to piece is, the more movement of shrinkage will take place. For a example, if clay shrinks 5% during drying, a piece of clay that is 5" long, will shrink 1/4" and a piece that is 20" long, will shrink 1" during the drying. This is why it is beneficial to know that the larger the piece is, the more important it becomes to let it dry evenly (slow drying will yield even drying). See next chapter about Air Drying. If one part drys faster than the other part, the dryer part will shrink more on wetter part which will create stresses on the clay, thus, cracking could occur. 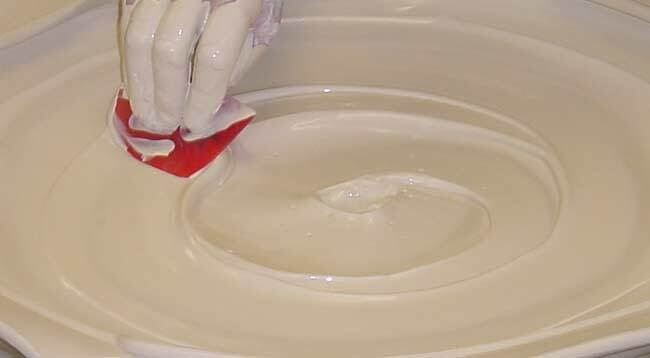 Shrinkage volume reduction - If the total shrinkage of clay is specified to be 11%, it will yield a 30% reduction in volume (cubic inches) which is important to account for when making bowls or containers of any sort. 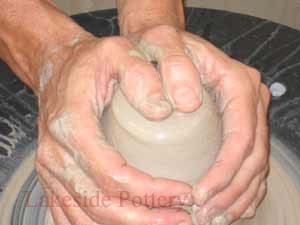 Wet clay contains a large amount of water, a minimum of 25% water. When clay starts to dry, water evaporates from it. As this happens, the particles of clay are drawn closer together resulting in shrinkage. 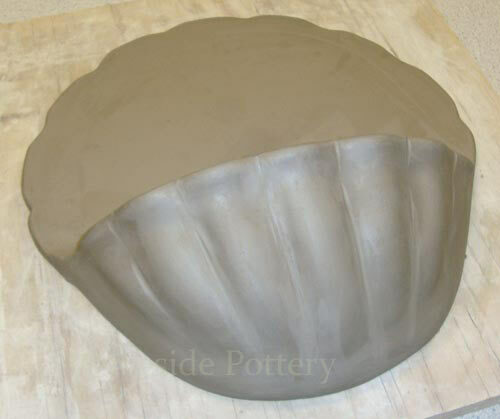 Many problems with clay are formed by uneven rates of drying, which create stresses in the clay. Sometimes these stress show up right away as cracks or warpage, other times not until during or even after firing. So it is important to ensure drying is even. This is done by ensuring uniform thicknesses throughout the piece, drying slowly, and even slowing down the drying of certain parts. Clays which have very fine particle sizes will shrink more than clays with larger particle sizes. 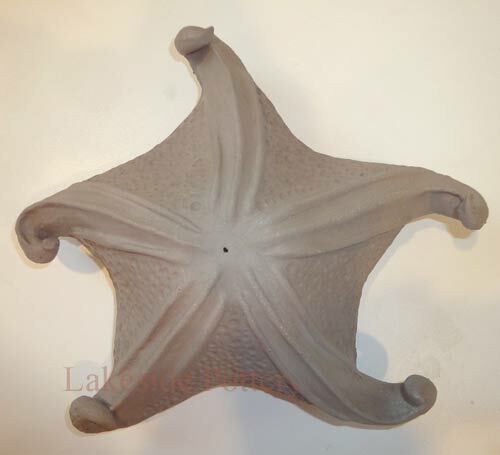 Porcelain clay has very fine particle sizes which makes it very plastic and also shrinks the most. These bodies have the most strength in the dry state. Groggy clays such as sculpture bodies shrink the least. (Grog is clay which as already been fired and then ground to various particle sizes.) These bodies shrink less because they have lower water content to start with, and also provide channels through which moisture can escape toward the surface. These are called "open bodies". 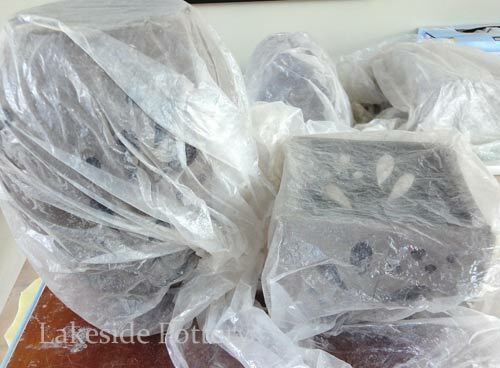 When the water has evaporated form between the clay particles, and all the remaining clay particles are in contact, drying shrinkage is complete. This is called the leather hard stage. The particles themselves are still damp, but their drying will not cause any additional shrinkage. 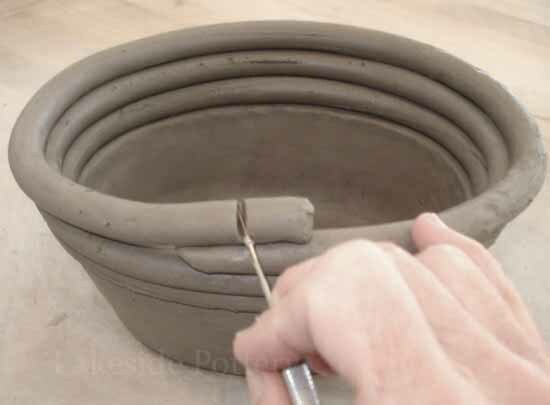 If pots are *damp or slightly wet, sometimes it is ok to expedite the drying by using a fan, warm kiln room or candling in the kiln. Generally, when candling in a computerized kiln going from ambient room temperature to 180 degree F, the temperature rise is slow and it takes approximately 2 hours to get there allowing the last minimal shrinkage and evaporation of the remaining water to occur gradually and slowly. If *damp pots are placed in the kiln room when the room is not too hot and the kiln room temperature rise is slow, it will have a similar beneficial effect as candling. 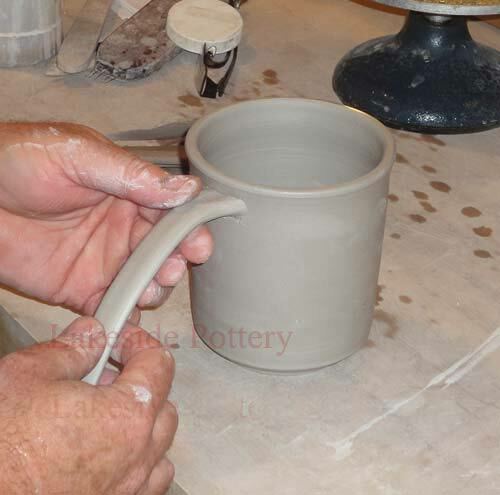 However, if you place damp pots in the kiln room when the room is already hot, the rapid temperature change will cause rapid drying and shrinkage which can place your pots at risk of cracking. Using a fan to move some air in the drying area where you have *damp pots can work if the air movement is not too strong and not aimed directly on the pots. 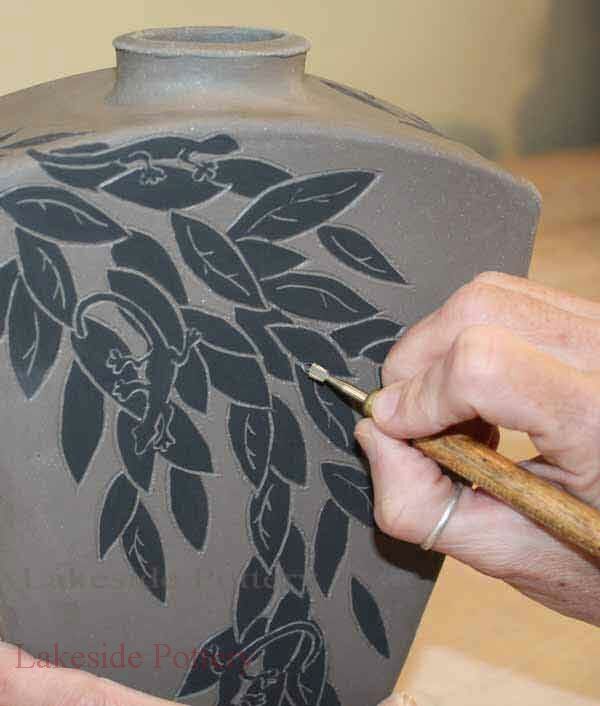 It is beneficial if pots are repositioned every so often to make sure that all sides are drying evenly. * "Damp" is referred to when the clay is almost dry but has slight signs of wetness. At this stage, most of the drying shrinkage has occurred and the clay does not have much remaining movement. Thus, it makes it relatively safe to expedite completion of the last bit of drying. 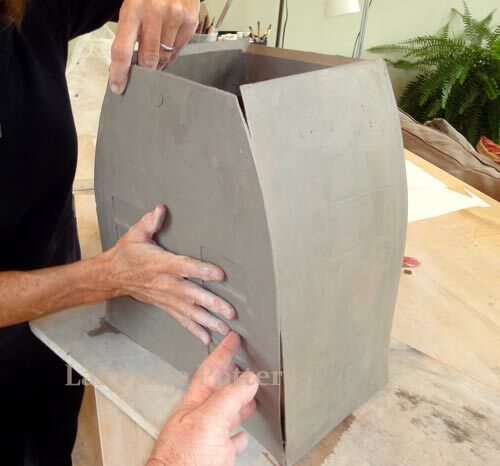 The only exceptions are large forms, in particular flat forms, and pots with walls that are thicker than 1/2". 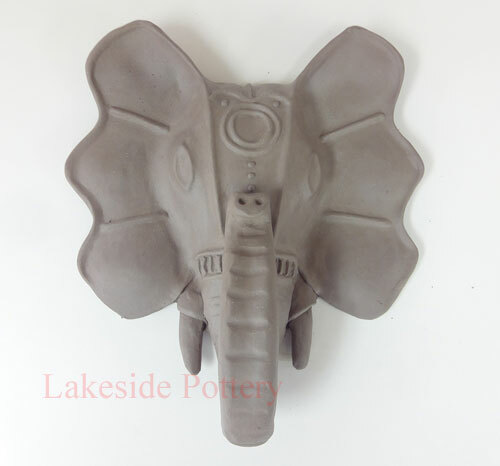 Complete drying doesn't take place until the piece is in the kiln. This happens when the boiling point of water has been reached (100 degrees C, or 212 degrees F.). This must happen slowly, or the formation of steam within the body of the clay may cause it to burst. For this reason, the early stages of firing are done slowly, and with a kiln vent operating, peephole or lid open for steam to escape. 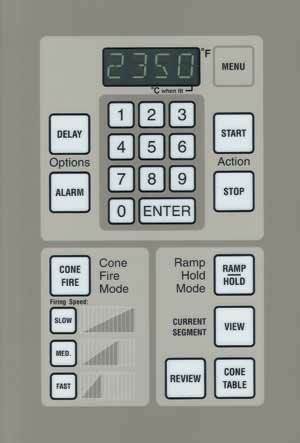 If computerized kiln controller is used, candle the kiln at 180 degree F for several hours. The next change which occurs is at about 350 degrees C (662 degrees F), the point where the chemically combined water of the clay is driven off. This is water that is part of the molecular structure of the clay, not the previously described water that is between the particles of the clay. This drying is completed by about 500 degrees C (932 degrees F). 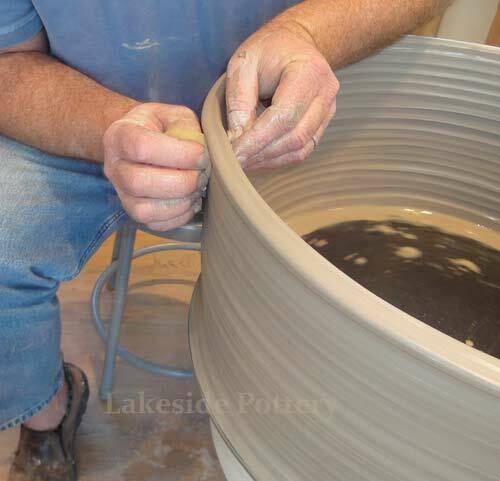 After this point you could no longer mix the dried clay with water to make new wet clay. An irreversible chemical change has taken place, known as dehydration. No shrinkage is observed during this stage. Another thing which happens up to about 900 degrees C (1652 degrees F) is the burning off of organic and inorganic materials, such as carbon and sulphates. These are the fumes that it is important not to breathe, and the reason a kiln should be well ventilated even during bisque firing. After dehydration, the next change that happens is Quartz Inversion, which happens at 573 degrees C (1064 degrees F). At this point, quartz crystals rearrange themselves into a slightly different order. A slight and temporary increase in volume occurs at this point. This is why you always need some space around pieces during firing, as they will expand somewhat. Firing should proceed slowly during this Quartz inversion. 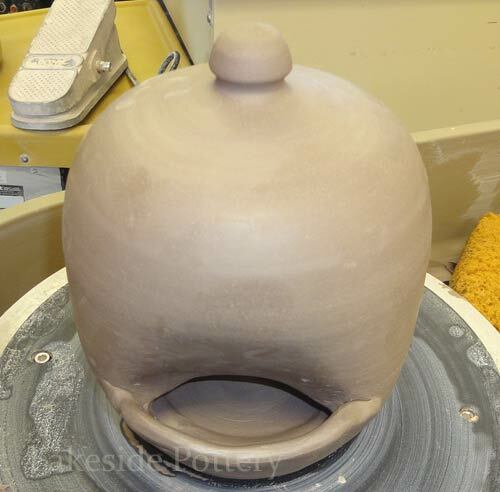 A large percentage of ware that is cracked during firing happens from fast firing through this stage. The factory set program on electronic kilns usually slow down the firing at this stage for you. The next stage that happens is vitrification. This is the hardening, tightening and finally the partial glassification of the clay. Vitrification results from fusions or melting of the various components of the clay. The strength of fired clay is increased by the formation of new crystalline growth within the clay body, particularly the growth of mullite crystals. Mullite is an aluminum silicate characterized by a long needlelike crystal. These lace the structure together, giving it cohesion and strength. Shrinkage happens at the vitrification stage. This is due to diminished size of the particles as they approach fusion and to the closer arrangement of particles in their glassy matrix. 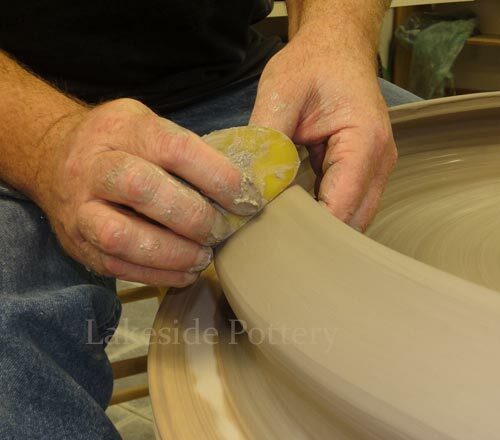 The firing shrinkage of a clay is usually about the same as the drying shrinkage. Total shrinkage will usually be about 8-12%. Clays vitrify at various temperatures depending upon their composition. A red clay high in iron and other impurities might fire to hardness at about 1000 degrees C (1832 degrees F) and melt to liquid at 1250 degrees C (2282 degrees F). A kaolin body which is very free from impurities might not melt until over 1800 degrees C (3272 degrees F)! By mixing the ratios of different types of clays that melt at different temperatures, clay bodies are developed for different firing temperatures. If you fired high enough, the clay would first swell up (bloat) then fuse into a liquid which would cool as a glass. Or course in ceramics we don't fire that hot; we stop at the point where we have just enough fusion and hardness for durability, but not too much so we cause melting or deformation of the ware. This point is called the maturing of the clay.